Joan Didion was born and raised in Sacramento, a place that provides the setting for her debut novel Run River published in 1963. The novel opens in the blistering heat of the summer of 1959. Shortly after midnight, Lily McClellan hears a gunshot outside her home, the ranch she shares with her husband, Everett, and two teenage children. At first she remains untroubled as if there was a sense of inevitability about the shooting. When she searches for her husband’s gun in the drawer of the bedside table, she finds it is missing; somehow she knew it wouldn’t be there. Fifteen minutes later Lily finds Everett down by the river that runs past the McClellan ranch where he has shot and killed her lover, Ryder Channing. Everett had known that Lily was due to meet Channing by the dock that evening, but he got there before her. This could have been a book about the aftermath of the shooting. Instead though we move back in time, and the majority of the novel focuses on the story of Lily and Everett’s relationship from 1938 to 1959. Lily has been studying at Berkeley for a year when Everett shows an interest in her. A shy and uncertain seventeen-year-old, Lily has struggled to form any meaningful relationships at college and seems reluctant to return. She falls in with Everett as it seems like the easy thing to do. Their families come from similar stock: both own and run agricultural ranches in Sacramento; both are descended from pioneers who made their way to California in the 19th century. With Everett away, Lily begins an affair with one of her neighbours, Joe Templeton. She doesn’t love him though; it’s a relationship going nowhere, born out of a sense of loneliness in Lily’s marriage and Joe’s need for a break from his alcoholic wife. The affair ends in pain for Lily and Everett, but they remain together despite a lack of understanding of what they really want from each other. Lily meets Ryder Channing through Martha – she and Channing ride out a turbulent relationship for the best part of five years. Everett dislikes him from the get-go. He sees Channing as a player; someone who could turn any situation to his advantage. Someone who has no business being around Martha. Channing is a figurehead for the new money flooding into California in the form of property investment and development. We know from the novel’s opening chapters that Lily has an affair with Channing, but I’ll leave it there to avoid revealing anything else about the plot. I loved the melancholy tone of this story. There is a sense of things dying here: Lily and Everett’s relationship; the traditional rancher’s way of life; people die too. I can’t imagine it being set anywhere other than California. In some ways, it’s a lament for a period that has all but disappeared. This is my first encounter with Didion, and I definitely want to read more of her work. Her prose is lucid and insightful. The book feels mature and assured for a debut novel – as if it’s been written by a more experienced author. Didion captures Lily’s character perfectly: the feeling of isolation in her relationship with Everett; the sense that he doesn’t know how to connect with her; the feeling she is acting out a part. There is something elusive, possibly unknowable, about Everett’s character…deliberately so, I think. Emma at Book Around the Corner has also reviewed Run River, and it was her excellent billet that prompted me read this book (number 10/20 in my #TBR20). Run River is published by Vintage International. Source: personal copy. This entry was posted in Book Reviews, Didion Joan and tagged #ReadWomen, #ReviewWomen2015, #TBR20, Book Review, Fiction, Joan Didion, US, Vintage International on March 9, 2015 by JacquiWine. Wow sounds amazing ….I have only ever read The Year Of Magical Thinking by her. I liked it very much, Helen. The Year of Magical Thinking is in one of my TBR piles, but I wanted to start with Didion’s fiction just to get a sense of her style. I’ve only read Didion’s non-fiction but this sounds well worth seeking out. It sounds like she incorporates the intelligent observation and clarity of expression into her fiction which makes her essays so striking. I think you’d enjoy this one, Susan. It’s very well observed, and the quotes should give you a good feel for the style. Her essays sound terrific; another reading friend has recommended Slouching Towards Bethlehem, so I’ll have to take a look. Have you read that collection? I have, also The White Album – both very fine. Thanks, Susan. I’ll take a look. Fascinating review, Jacqui! I’ve read much of Didion’s non-fiction, which I love, but never her fiction – must remedy that! Thanks, Karen. Run River would be a good place to start with Didion’s fiction (and it’s her debut). I’d like to try her non-fiction too. I already have a copy of The Year of Magical Thinking – have you read it? Any others you’d particularly recommend? I have – it’s very powerful and moving. Her seminal non-fiction works are “Slouching Towards Bethlehem” and “The White Album – both excellent reads. Oh, that’s great – thanks, Karen. The essays do sound tempting. One thing that stands out to me in relation to the description of this book is how real it seems. I know of so many couples and families who seem to be detached from one another and are thus wallowing in loneliness. People also seem to be detached from themselves. It sounds like you read another great book Jacqui. Yes, it did feel very true to life. They were very young when they married, and it was the wrong decision for both of them. I’d like to think things would be different now. Lily would have more options, a chance to build a different life instead of drifting into marriage at such an early age. I’m right in the middle of a terrific run of books at the moment, long may it continue! This sounds great. Never read anything by this author. She’s worth a look, Ali. I had to read some of her non-fiction in college, and partly because of the professor, I haven’t spared Didion another glance. So thank you for this review, because now I think I should really look into her fiction. I liked Run River very much – the style, the mood, the story. 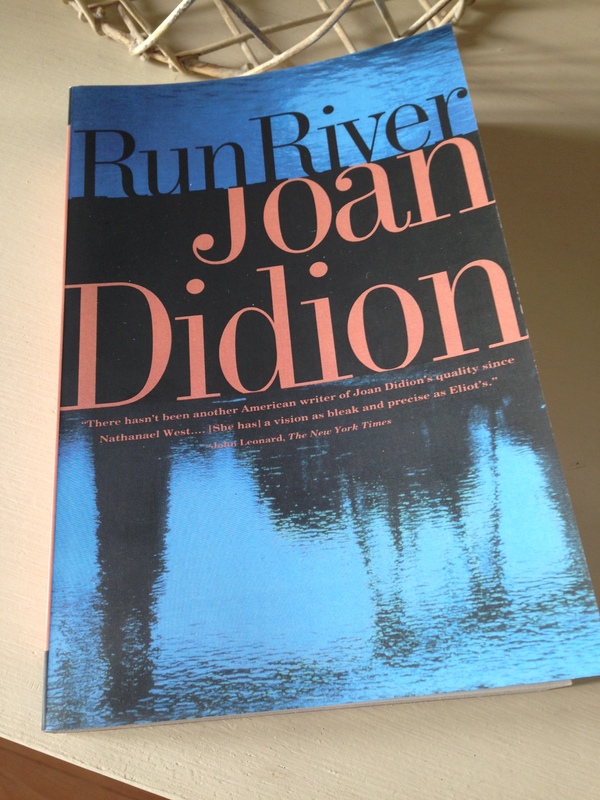 Didion’s fiction is definitely worth a look and Run River would be a good one to try as it was her first novel. I plan to read Play it as it Lays a little later in the year, hopefully as a readalong with Emma if she’s still up for it. Beautiful review, Jacqui. I’ve read some of Didion’s early essays and whilst I really loved her prose style, the essays ended abruptly and all had a truncated feel. I didn’t know she’d written a novel, and I presume it doesn’t suffer from the lack-of-an-ending issue the essays did. I really must read more of her. Whatever she does is intriguing. Thank you. Oh, that’s interesting, Victoria. I haven’t read any of her non-fiction, so I can’t speak to a comparison between the novel and her essays, but the novel’s ending didn’t feel abrupt or curtailed. That said, Run River is very much about what happens in Lily and Everett’s marriage as opposed to the aftermath of the shooting (we a see a little of that but not a lot). Consequently, the final chapters may leave some readers feeling a little unsatisfied. As I say, I didn’t feel that way as I read it as a portrayal of a disconnected marriage…it’s just a thought though. I also like the way Didion leaves sufficient ‘space’ in the novel for the reader to consider the situation and read between the lines a little. She doesn’t spell everything out! I definitely want to read more: another novel and some non-fiction as well. I’ve been meaning to get into this for a while. She’s amazing. Thanks for the great review! If you’re ever interested in some other awesome book reviews and musings, be sure to follow! Thanks!!! You’re very welcome. I definitely want to read more of her. Thanks for following – I’ll take a look at your blog. I’ve heard so much about Didion’s non-fiction, but never anything before about her fiction. Good to know it’s worth looking into! Thanks for the review! You’ve very welcome, Naomi. Several people seem to have read or heard about her non-fiction, but I wanted to start with a novel as most of my reading is fiction. I can’t think why I haven’t read her before now! I’m really glad you enjoyed it, Jacqui. I thought it was an amazing book and your review captures well the sadness and aloofness in it. I felt so sorry for Lily too. She seemed unable to go out of her shell. She never became an adult, in a sense. It also reflects her time, women had no real choice to self. They had to be a daughter, a mother or a wife. Reading your review and the quotes you picked, I think there’s a similar tone in The Bell Jar. Martha and Everett’s relastionship is definitely unhealthy. I wonder how it is to live with a Martha. It must cost a lot of energy. PS : Thanks for the link to my billet and yes, I’m still planning on reading Play It As It Lays with you next month. I loved it, Emma! Thank you for putting me onto it. I’ve been meaning to read Didion for ages (can’t think why I’ve never tried her before) and Run River was a great place to start. I hadn’t thought about The Bell Jar…you’re right, the tone is similar. I liked the contrast between Lily and Martha; they were so different from one another. Martha would be hard to live with but easier to ‘read’ than Lily. Did you get the feeling there were other men in Lily’s life? The opening chapter seems to hint at other one-night stands or affairs, but I don’t think we hear anything more about this? Glad to hear you’re up for reading Play it as it Lays next month. Would the end of April/early May work for you? Yes I think there were other men in Lily’s life. I don’t know what she was looking for in these affair. A little bit of warmth? Distraction? Oblivion? The pleasure to have a secret life? Did she like the attention? Her world seems stuck and she had to slip into a grown-up’s clothes when she wasn’t ready. And at the same time she went away to college, she had a chance to live on her own and she blew it. I don’t envy Everett’s life, in love with someone who mildly returns his feelings and a bit smothered by an almost incestuous sister. I wondered if Lily was trying to experience a bit of the life she should have had at college…play the field to some extent, recapture her youth. It was almost as if she was behaving like Martha, getting drunk at parties, etc. I know what you mean about Everett, I felt for him. Didion holds the reader so close to Lily’s point of view, it’s difficult to get a sense of his feelings. It can’t have been easy for him. All this discussion is getting me in the mood for Play it as it Lays. It’ll be fascinating to see how it compares to Run River. I love Didion’s non-fic but have never read her fiction – and this sounds great. Definitely on my list. Thank you for the thoughtful review. You’re very welcome, Lizzi. Glad to hear you like the sound of this one. I really need to try some of her non-fiction, so many people speak highly of it. Isn’t it just? I’ve a feeling Run River will stay with me too. It’s very interesting to read your comments because Lily and Everett’s story felt so true to life, grounded in a sense of reality. I probably didn’t say enough about it in my review, but this novel has a real sense of place. I’ve never visited this region of California, but I could visualise the Sacramento Delta in my mind’s eye, not just from Didion’s descriptions of the landscape but something else too. It felt like a lament or elegy to the passing of a way of life. Well, I’m glad you offered a recommendation as I was just about to ask! Some Dreamers of the Golden Dream (what a terrific title) – I shall have to chase it down. Thanks, Scott. Well, having found a copy of this essay online I finally got around to reading it this weekend. It is indeed tremendous; I found it utterly haunting. Thanks so much for suggesting this, Scott. Once again, you were right on the money. Another writer I’ve never read (and only really know for her non-fiction). Cassandra comparison makes me sit up and take notice – as does ‘melancholy tone’ – sounds just my thing! Well, I’ve only just made a start with Didion! Martha is a supporting player (as it’s Lily and Everett’s story) but she reminds me of certain aspects of Cassandra’s character – the needy, high-maintenance side, in particular. Martha’s get up and behaviour at the train station, that’s very Cassandra! I think you’d like it, Grant. Somehow, your review reminds me of something Joyce Carol Oates would have written. She’s a great one for distressing family sagas in which one feels great compassion for the heroine. Compassion, or so much depression I want to fling the book far and away. I haven’t read Joan Didion, but I did buy her Year of Magical Thinking when I was of the mind to get strong for the future loss of loved ones. A ridiculous thought on my part, as if I could fully prepare, but still I want to read her work. Do you know, I’ve never read Joyce Carol Oates. Another author I should consider at some stage. That’s a very apt description of the tension between compassion and depression. Lily and Everett’s story is very sad, but Didion tells it with such insight that one can’t help but feel a sense empathy for them. I’ve only ever read her non fiction as well, this sounds great! I can imagine how well Didion inhabits her characters after seeing what she is capable of. I loved this one, Claire – it’s seriously impressive for a debut novel. I really need to try some of her non-fiction, so many people rave about it. I have Blue Nights as well, so will probably read that, although its kind of a tough subject for me personally. I feel much the same way about The Year of Magical Thinking. It’s a book I want to read, but it’ll be a case of finding the right moment. Next year, perhaps. great review, Jacqui :) I love the way you describe the detachment in Lily and Everett’s relationship. such a complicated story with complicated characters. I always find this kind of story very compelling. Thanks, Ratih. That sense of detachment is very strong. I think you’d like this one. As you say, the characters are complex and nuanced. It’s an impressive debut. Why did I accidentally buy this as a kindle book. It does sound terrific. I already thought so when I read Emma’s review. It’s been a while since I last read a book I didn’t want to end. I really don’t like reading novels on the kindle but buying it twice? It’s great, Caroline. Emma nailed it in her review, so I’m not sure if I’ve added very much to the discussion, but I think you’d like it. I could have happily stayed with these characters for another 50 pages or so. It ends at exactly the right point, but Didion leaves plenty of space in Lily and Everett’s backstory. I tend to prefer physical books too, especially if I’m going to review something (although it can be hard to resist the occasional cheapie on the Kindle). I’ve tried to read Didion’s fiction before and go stuck – I think this book would be a good place to try again. It’s worth a try – let me know how you get on! Skipping the comments to avoid spoilers. Between you and Emma this is another one for the TBR, though I wish there were a kindle version. Still, even if it’s not Didion’s best it does sound exceptionally good. I’m eager to get to Play to see how the two novels compare to one another – it’s on the list for late April, and Emma will be reading it too.